I hope this offers some insight to your water intake, or fluid intake on a daily basis. 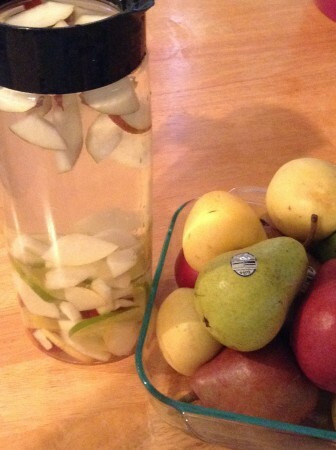 So, to help you enjoy water just a little bit more, why not try a fruit infused water? Rinse your fruits well. If you have a fruit and vegetable wash solution use that to be sure you're using clean fruit. Another way to clean your harder fruits it to soak your fruits in 1/2 cup vinegar + 1/2 gallon water. Soak the fruit for 7-10 minutes. Rinse well. Add sliced pears and limes. Let stand in the refrigerator for 2-3 hours to infuse the water.